The Mississippi Madawaska Land Trust covers an area that extends from the western part of the City of Ottawa in the east to Lake Mazinaw and Hyw. 41 in the west, from Sharbot Lake in the south to the lower Madawaska River in the north. A map of the Land Trust area is shown below. The Land Trust is centrally located within the Algonquin to Adirondack corridor and immediately adjacent to the Frontenac Axis Biosphere Reserve (a designated UNESCO site). This region is geologically very complex and variable, comprised of both shield and highlands of granite, marble, gravel ridges, and lowland clay plains. Because both upland natural areas and wetlands still abound, the region as a whole is vital to wildlife preservation and to species and ecosystem diversity. Significant parts of these lands are undisturbed which enables natural qualities to continue uninterrupted. In Lanark County alone, it still includes some 12,000 acres of County forests as well as significant parcels of Crown lands. Roads, while plentiful in the built up areas, are often limited or absent from the more remote and rugged highland areas. The area has a rich cultural and historical background. The areas away from concentrated human settlements still have relatively small population pressures and hence threats to the wilder areas are not yet as great as they are bound to become. 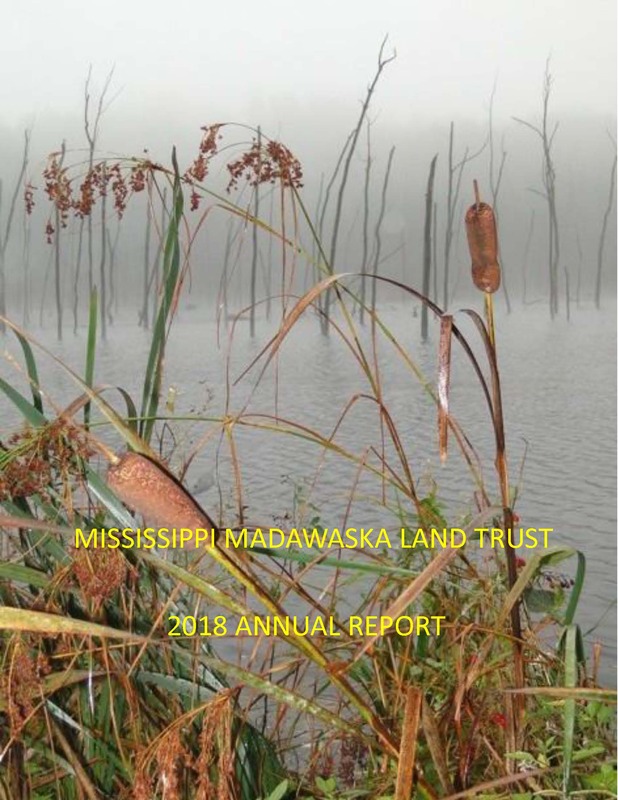 In this light, the Mississippi Madawaska Land Trust represents a time-limited opportunity for preserving the most valuable of these lands that still exists. The area includes three distinct regions, each with its own unique features. Ottawa West includes a part of the City of Ottawa and contains the catchment basins of the Carp River and Constance Creek with the Carp Hills at the approximate centre. This is a rapidly urbanizing area characterized today by intense development pressures on the remaining farmland, forests and wetlands. Nature is in rapid retreat. The area still includes some rich farmland. A very small area where nature is protected is found in the beautiful Morris Island Conservation Area bordering on the Ottawa River and owned by Mississippi Valley Conservation Authority. It is located just above the Chats Hydroelectric Dam where one can enjoy a lovely nature trail through forests and river shoreline. The lower south side of the Madawaska River is included in our land trust. The highlands between the Mississippi and the Madawaska include some of the most spectacular scenic lookouts, such as McCreary and Evergreen Mountains, large lakes such as White Lake and some wilderness lakes such as Round and Long Schooners. Much of the higher land is Crown and subject to cyclical logging. There are many Provincially Significant Wetlands and Areas of Natural and Scientific Interest (ANSI) in this region and several are legally protected from logging and mining. Some examples would include the White Lake Wetlands Reserve where a combination of forest and wetlands provide habitat for rich biological diversity, and the Fortune-Schooner ANSI which is one of the wildest and most beautiful areas in eastern Ontario. Some private lands have outstanding natural features and would qualify for long term protection under the roof of a land trust. The largest part of our region includes the entire catchment basin of the Mississippi River, starting at Mazinaw Lake and Bon Echo Provincial Park in the west and extending eastward to the height of land separating the Mississippi River and the Rideau and Tay Rivers. It includes much Crown Land which is now systematically logged, a dozen larger lakes, and numerous wetlands and streams. In the days of European colonization, the area was largely cleared of its forest and repeatedly burned. Abandoned farms and regenerating forests abound. In the valleys and areas with better soils we now find a patchwork of small towns and hamlets. The region is renowned for its recreational values. Bon Echo Provincial Park, the Purdon and Palmerston-Canonto Conservation Areas, and the Mississippi Lake National Wildlife Area and Bird Sanctuary all fall within this watershed. Most land in the region is privately owned. Protection of many beautiful and ecologically valuable parts of this region is at the discretion of private landowners. These owners may choose to take this opportunity to preserve their ecologically valuable land in perpetuity. This is the unique and principal role of land trusts in Ontario.